At this time, our bottles are available to ship to Pennsylvania residents only. Click the link below to check out our shop page. “BERINGEI” is the scientific name shared by all Mountain and Eastern Lowland Gorillas. We are proud to craft an American Vodka from pure mountain water and quality winter wheat grain that captures the essence of BERINGEI. BERINGEI VODKA is distilled using a continuous column distillation process. The sweet flavorful character of winter wheat delights at every sip, swallow, and dare we say, gulp. We proudly source the winter wheat used in this supremely smooth vodka from Woods Mill, just 20 miles south of Charlottesville. Charles Darwin said, “No other member in the whole class of mammals is colored in so extraordinary a manner as the adult male mandrills.” STRANGE MONKEY GIN is crafted on site in a dedicated gin still. We do not steep botanicals in bags, such as making a cup of tea. Gorillas don’t drink tea. We do not contract others to add gin flavor for us. STRANGE MONKEY, made the traditional way – by capturing the essence of our quality botanicals (juniper berries, coriander, anise, citrus peels, and almonds) through distillation. Our recipe is traditional. Our gin is eminently drinkable. The winter wheat in this ground breaking spirit is locally sourced from Woods Mill. THE FINEST RYE IN THE GLOBAL JUNGLE CAN ONLY BE MADE FROM HAND-SELECTED MILLED GRAINS, PRISTINE WELL WATER AND PERFECTLY CHARRED BARRELS. OUR REPUTATION FOR CREATING INTERNATIONALLY ACCLAIMED CRAFT SPIRITS MEANS THAT WE MUST DISTILL AND AGE A WHISKEY THAT CAN BE SIPPED AND ENJOYED AT ANY AGE ANYTIME. AGED A MINIMUM OF THIRTEEN MONTHS, OUR CURRENT BATCHES ARE RELEASED AT OVER 2 YEARS OLD. YOU WILL ENJOY NOTES OF PEPPER AND SPICE UP FRONT WITH A SMOOTH, MELLOW FINISH THANKS TO THE WHITE CORN AND BARLEY PRESENCE. SO POUND THE TABLE, THUMP YOUR CHEST AND RAISE YOUR GLASS. BLACKBACK RYE WHISKEY IS PROUDLY DISTILLED IN VIRGINIA FOR ALL SIMIANS WORLDWIDE. RULE YOUR NEST, BE AN ALPHA. SILVERBACK CRAFTS ITS CUSTOM HONEY LIQUEUR FROM OUR VERY OWN BERINGEI VODKA MIXED WITH RAW HONEY FROM HUNGRY HILL FARM IN NELSON COUNTY, VIRGINIA. THIS LIQUEUR, BLENDED WITH OUR FAMOUS BLACKBACK LUCKY 13 RYE WHISKEY, CREATES A FLAVOR SO PURE AND SWEET THAT YOU MANY WANT TO LEAVE WITH A WHOLE CASE (WHICH MANY HAVE DONE). SO, SIMIANS, PUT ON YOUR BEEKEEPER SUIT AND GET YOUR BUZZ ON. 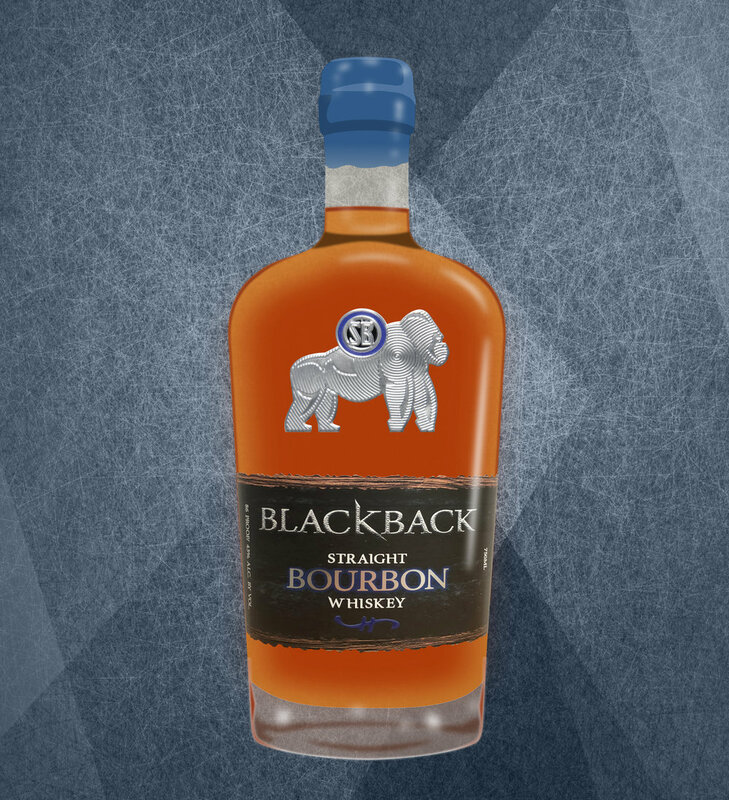 OUR MOST EXCLUSIVE AND SOUGHT AFTER PRODUCT, BLACKBACK STRAIGHT BOURBON IS AGED FOR A MINIMUM OF TWO YEARS. BARRELS ARE CAREFULLY SELECTED FOR SINGLE BARREL RELEASES. THIS SPIRIT MAY BE THE ULTIMATE BUTTERSCOTCH BOMB, WITH NOTES OF VANILLA AND OAK CONTRIBUTING TO THE VERY BEST ALL-VIRGINIA BOURBON. ONLY AVAILABLE IN HOUSE. OUR SIGNATURE STRANGE MONKEY GIN HAS AGED FOR THREE MONTHS IN OUR USED BLACKBACK RYE WHISKEY BARRELS. THE NOTES OF OAK, VANILLA AND PEPPER COMPLIMENT THE FLAVORS THAT OUR GIN IS KNOWN FOR. ONE BATCH ONLY AND AVAILABLE EXCLUSIVELY IN HOUSE. ON DECEMBER 5, 1933 CONGRESS PASSED THE 21ST AMENDMENT, RESULTING IN THE REPEAL OF PROHIBITION. TO CELEBRATE THE ANNIVERSARY OF THE REPEAL, WE ARE RELEASING ROUTE 151 PROOF BLACKBACK MOONSHINE ON DECEMBER 9TH. THIS SPIRIT IS THE SAME THAT FILLS OUR AMERICAN WHITE OAK WHISKEY BARRELS TO BECOME OUR BOURBON. A SUPERIOR BOURBON STARTS WITH A PURE, HANDCRAFTED SPIRIT. THIS EAGER CONCOCTION ALSO NESTS IN THE BARRELS, READY TO LEAP OUT AT FIRST TAP. ONLY AVAILABLE IN HOUSE.